A NASA spacecraft that will return a sample of a near-Earth asteroid named Bennu to Earth in 2023 made the first-ever close-up observations of particle plumes erupting from an asteroid's surface. Bennu also revealed itself to be more rugged than expected, challenging the mission team to alter its flight and sample collection plans, due to the rough terrain. Bennu is the target of NASA's Origins, Spectral Interpretation, Resource Identification, Security-Regolith Explorer (OSIRIS-REx) mission, which began orbiting the asteroid on Dec. 31. Bennu, which is only slightly wider than the height of the Empire State Building, may contain unaltered material from the very beginning of our solar system. "The discovery of plumes is one of the biggest surprises of my scientific career," said Dante Lauretta, OSIRIS-REx principal investigator at the University of Arizona, Tucson. "And the rugged terrain went against all of our predictions. Bennu is already surprising us, and our exciting journey there is just getting started." Shortly after the discovery of the particle plumes on Jan. 6, the mission science team increased the frequency of observations, and subsequently detected additional particle plumes during the following two months. 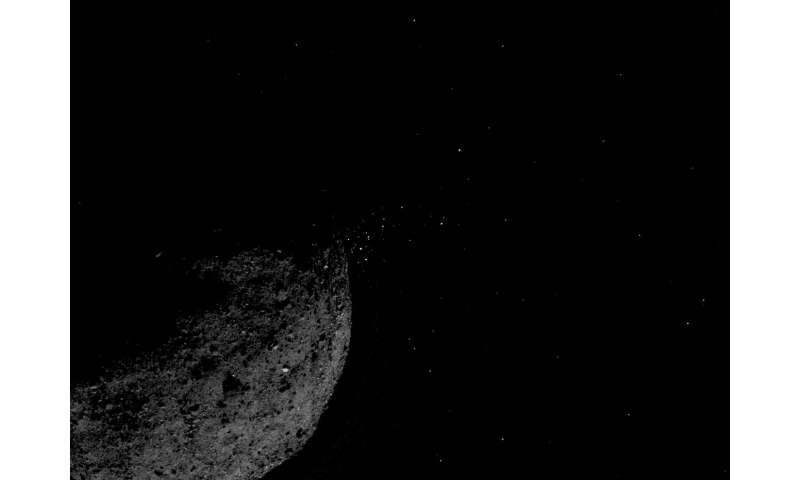 Although many of the particles were ejected clear of Bennu, the team tracked some particles that orbited Bennu as satellites before returning to the asteroid's surface. "The first three months of OSIRIS-REx's up-close investigation of Bennu have reminded us what discovery is all about—surprises, quick thinking, and flexibility," said Lori Glaze, acting director of the Planetary Science Division at NASA Headquarters in Washington. "We study asteroids like Bennu to learn about the origin of the solar system. OSIRIS-REx's sample will help us answer some of the biggest questions about where we come from." The OSIRIS-REx team also didn't anticipate the number and size of boulders on Bennu's surface. From Earth-based observations, the team expected a generally smooth surface with a few large boulders. Instead, it discovered Bennu's entire surface is rough and dense with boulders. 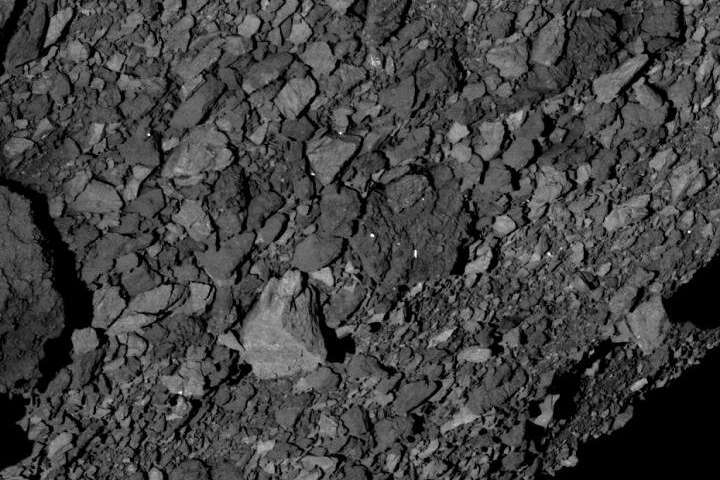 The higher-than-expected density of boulders means that the mission's plans for sample collection, also known as Touch-and-Go (TAG), need to be adjusted. The original mission design was based on a sample site that is hazard-free, with an 82-foot (25-meter) radius. However, because of the unexpectedly rugged terrain, the team hasn't been able to identify a site of that size on Bennu. Instead, it has begun to identify candidate sites that are much smaller in radius. "Throughout OSIRIS-REx's operations near Bennu, our spacecraft and operations team have demonstrated that we can achieve system performance that beats design requirements," said Rich Burns, the project manager of OSIRIS-REx at NASA's Goddard Space Flight Center in Greenbelt, Maryland. "Bennu has issued us a challenge to deal with its rugged terrain, and we are confident that OSIRIS-REx is up to the task." The original, low-boulder estimate was derived both from Earth-based observations of Bennu's thermal inertia—or its ability to conduct and store heat—and from radar measurements of its surface roughness. Now that OSIRIS-REx has revealed Bennu's surface up close, those expectations of a smoother surface have been proven wrong. This suggests the computer models used to interpret previous data do not adequately predict the nature of small, rocky, asteroid surfaces. The team is revising these models with the data from Bennu. The team has directly observed a change in the spin rate of Bennu as a result of what is known as the Yarkovsky-O'Keefe-Radzievskii-Paddack (YORP) effect. The uneven heating and cooling of Bennu as it rotates in sunlight is causing the asteroid to increase its rotation speed. As a result, Bennu's rotation period is decreasing by about one second every 100 years. Separately, two of the spacecraft's instruments, the MapCam color imager and the OSIRIS-REx Thermal Emission Spectrometer (OTES), have made detections of magnetite on Bennu's surface, which bolsters earlier findings indicating the interaction of rock with liquid water on Bennu's parent body.
. From Earth-based observations, the team expected a generally smooth surface with a few large boulders. Instead, it discovered Bennu's entire surface is rough and dense with boulders. Interpretation can be a son of a gun. You would think the continuous failures of the standard guesswork would encourage a modicum of humility from the acolytes. You would think that after spending years reading and commenting on science articles, at least a modicum of science would lodge in even the most sluggish of minds.